(Mother Earth News) You can use many household organic “waste” materials to produce your own natural gas for cooking, lighting, and space and water heating. This gas, known as “biogas,” can also replace fossil-based natural gas to fuel an engine or an absorption cooling system, such as a gas refrigerator or chiller. Some gasoline engines are designed for or can be modified for use with natural gas, propane or biogas. Diesel engines can accept up to 80 percent biogas. 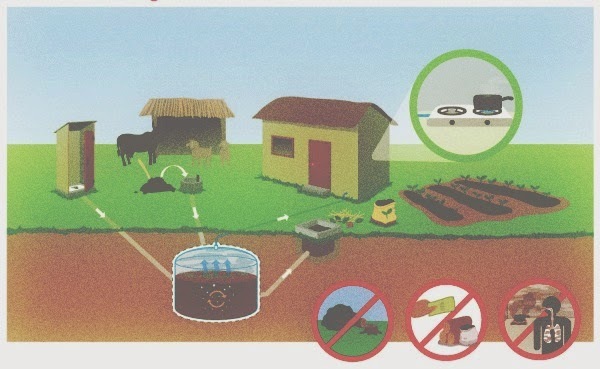 As you produce biogas, pipe it into a simple holding container, such as a small barrel inverted into a larger barrel that is filled with water. Any storage container that is airtight and expandable as gas flows in and out can be used. Apply external weight to the storage container to achieve the correct pressure required by your gas appliance. Municipal solid-waste landfills make up the third-largest source of methane emissions in the United States. But rather than releasing methane into the atmosphere, where it exacerbates climate change, the gas can be captured to produce electricity. According to the U.S. Environmental Protection Agency, about 600 U.S. landfills capture methane to use in a variety of ways, including firing glass-blowing and pottery kilns, heating greenhouses, and even powering an ice rink. Other planned projects will convert landfill gas to methanol for use as an alternative fuel for vehicles. Background and Personal History: Paul Scheckel is a hands-on, off-grid homesteader and experienced energy efficiency and renewable energy professional. He is the author of The Homeowner’s Energy Handbook , and The Home Energy Diet, along with various magazine articles for Mother Earth News, Home Power, Vermont Life, and more.